The Prime Bucktail Jig is not like any other jig on the market. The unique shape of the head and placement of the eyelet help bring this lure to life. With bulging eyes, holographic finish and blazing color, it puts fish at your mercy. The uniqueness of this bait is that it doesn't fall or hang straight down like other bucktails. It glides through the water, almost swimming along. When jigged, its body stays almost parallel to the bottom maintaining a very natural appearance. Like all SPRO products, Prime Bucktail Jigs are made with durable, super sharp Gamakatsu hooks. Once you fish it, you'll know why SPRO is the shape of things to come. It's hard to fish the Prime Bucktail wrong. It can be jigged off the bottom for weakfish, fluke, or other saltwater fish. Cast it at schooling fish working it quickly back to the boat for cobia, stripers, snook, or dolphin. Swim it along in freshwater for big bass and walleyes, or troll it for reservoir stripers. It's hard to find somewhere that the Prime Bucktail won't work. View larger Finally, a jig made to penetrate brushpiles and punch through grassbeds with equal efficiency. 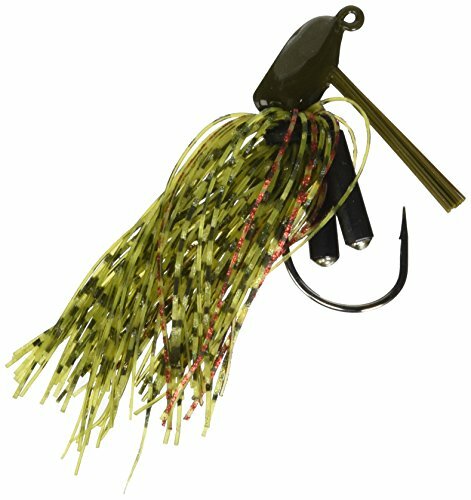 The Booyah Boo Jig features a flat-bottom 18-degree rise, premium black nickel hook, heavy weed guard, magnum rattles and a full-body 50-strand silicone skirt. Flip It, Pitch It, Cast It The Booyah Boo Jig is an all-around bass jig, perfect for pitching, flipping and casting to deeper water. With a variety of color patterns and sizes, the Boo Jig truly is a jig for all seasons. The positioning of the line tie means the Boo Jig also makes a good jig for those times when bass want the jig to swim up off the bottom. Plus, the angle of the line tie and the hook ensures the hook point is ready to sting any fish that bites. Just Say Boo! It's scary how effective the Boo Jig can be on bass hiding in thick cover. This jig gets into the thick cover and pulls them out. Doesn't matter if it's a deepwater brush pile, flooded shoreline buckbrush or massive carpets of matted vegetation, the Boo Jig is the tool for the job. makes it a great choice for the fresh and saltwater anglers. 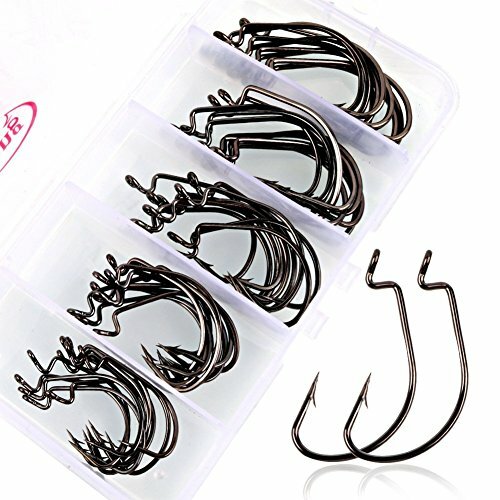 50pcs fishing hooks in a plastic box. High carbon steel construction for strength and durability. Features a barb for secure hold. The barb was designed to lock fish retreat and let the fish have nowhere to go. increase your chances to catch more bigger fishes. WARNING: Sharp Fishing Hooks, Please Stay Away From Children ! High carbon steel construction and offset point design, makes it a great choice for the fresh and saltwater anglers. extra wide gap offers more consistent hookups adds higher tensile strength,durable in use. The fishing hooks are really sharp with special barb hooks design,for less mortality rate.The barb was designed to lock fish retreat and let the fish have nowhere to go. Fine workmanship,don't rust stay sharp and meet the standards,rigging with worms,and other plastic rubber soft baits. High quality angler gear for all types of fishers which will significantly increase your chances to catch more bigger fishes. Various Size and Mini Box Size , Easily Fits In Pocket, Backpack. Sougayilang Worm Fishing Hooks Allow You To Travel To Your Favorite Fishing Spot and Enjoy Fishing Whenever and Wherever You Want. Package Included: 50pcs -10pcs each for size 2#, 1# ,1/0, 2/0, 3/0, In A Plastic Box . Searching for high quality soft bait ? Worm Bait Search ASIN : B072DVJBPQ ; Soft Shrimp Bait Search ASIN: B01NAJDNPD. Other Reproductive Harm. Do Not Eat Product. Wash Hands And Skin Thoroughly After Use. Popular sizes now available : 1/32 oz-#6, 1/16 oz - #4, 1/8 oz-#1 , 1/4 oz-#1/0 , 3/8 oz-#2/0 , 1/2 oz-#3/0 . Bulk pack to minimize logistic fee of each piece,you can get best quality with best price. Spray-painting make eyelets clear Unique design 3d fishing eyes - make it looks like a real fish. Brilliant stable assorted colors - baking after spray-painting repeatedly. including seven process. Chemically sharpened barbed hook - the fishing jig head has premium solid and durable body design. The tip hook is sharp , durability and strength is higher.The sharpened hook ensures better penetration , you could get your bait to the target effectively. With its patented, bladed swim jig design, Z-Man's ChatterBait Elite builds upon the Original Chatterbait's success. Featuring a 5/0 Gamakatsu hook, an EZ Skirt jig skirt with low-profile hub, and eye-catching head paint schemes, the ChatterBait Elite is sure to find a home in the front of your tackle box. Includes stainless ChatterBlade with a strong, quick-clip line tie and strengthened head-to-blade connection. The Strike King Red Eye Shad is one mean lipless crankbait. 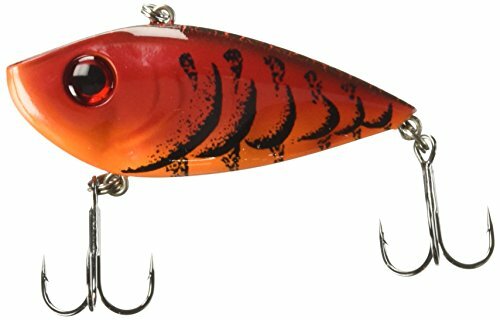 Designed by our National Pro Staff, the Red Eye Shad has incredible action and features some awesome paint jobs. Premium hooks, 3D eyes and free floating rattles give you the best action and sound of any lipless crankbait on the market. The Strike King Red Eye Shad is one mean lipless crankbait. Designed by our National Pro Staff, the Red Eye Shad has incredible action and features some awesome paint jobs. Premium hooks, 3D eyes and free floating rattles give you the best action and sound of any lipless crankbait on the market. The action when it free falls is awesome!!! Unique Shad styled body with VMC Vandium Cone Cut Hooks. A weedless version of our popular Finesse ShroomZ jighead, the Finesse ShroomZ Weedless features a double stainless multi-strand wire weedguard that makes it possible to employ Midwest Finesse tactics around grass, brush, and laydowns without constant snagging and fouling. Also armed with Z-Man's exclusive welded wire keeper to make rigging with ElaZtech baits fast and easy, these jigheads pair perfectly with baits like the Finesse TRDTM, Hula StickZTM, and Finesse ShadZTM to create the perfect Ned Rig! Adjustable, dual multi-strand wire weedguard provides increased snag resistance. Super-sharp, premium high carbon black nickel hooks. Pairs perfectly with a variety of Z-Man finesse baits to create the perfect Ned Rig. Available in green pumpkin and black finishes in 1/10, 1/6, and 1/5 oz weights. 5 jig heads per pack. Unique, welded wire keeper is easy to rig with 10X Tough ElaZtech plastics and prevents baits from sliding down the hook shank. Super-sharp, premium high carbon black nickel hooks. Pairs perfectly with a variety of Z-Man finesse baits to create the perfect Ned Rig. No lure in recent memory has had such a profound impact on freshwater fishing as The Original ChatterBait. With its patent-pending design and unique hex-shaped ChatterBlade, the sound, vibration, flash, and action of The Original ChatterBait is unmatched. The Original ChatterBait is designed to -Inchswim-Inch in an erratic motion that mimics wounded prey. It offers the action of a crankbait, the profile of a jig, and the flash of a spinnerbait. The Original Blakemore Road Runner Bulk Heads come painted with a silver blade and non-barbed heads. The FouceClaus 10 Pcs in-line spinners with most popular and effective dressed hook have caught more fish than any other spinners on the market today. The secret to the success is the spinner blade. It does two things. First, it puts out a ton of vibrations in the water. And second, it creates a lot of flash. Our blade adopts classic French blade with Laser reflective material painted provides continuous flash and vibration. The blade spins creating varying degrees of flash and vibration that mimics small fish. Our fishing spinners offers three different sizes and styles to give the fishing enthusiast more options. You can fish them with a straight retrieve, which is the standard way to use them, or use a stop and go method. You can work them deep and slow or burn them near the surface and they can be cast, swung, trolled or even back-trolled. 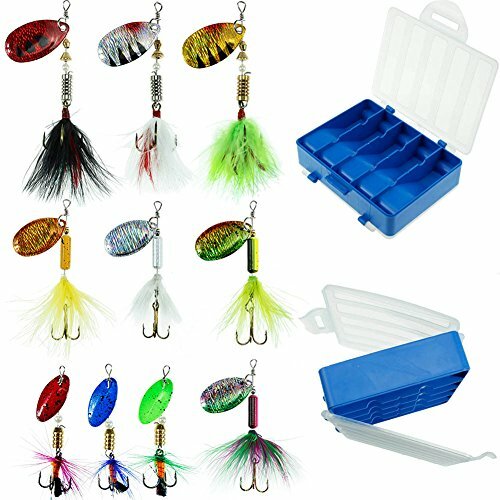 10pcs Fishing Lures Set with Tackle Box, Most popular size: 1/13 oz , 1/8 oz , 3/16 oz. Each Spinnerbait comes with a dressed sharp treble hook with brightly colored strike-attractor sleeves. Dressed spinners is both for Freshwater and Saltwater. The packing box makes you more convenient to use and restock. 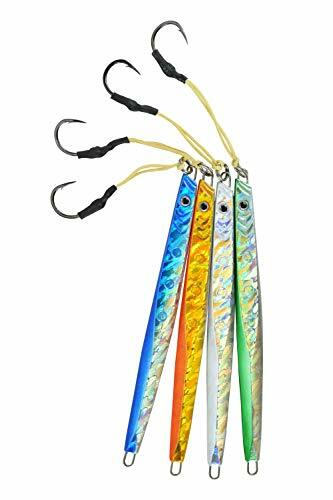 Premium quality blade provides continuous flash and vibration.They are desiged for bass fishing and trout fishing, named bass lures and trout lures as well. Deadly on Bass, Trout, Walleye, Northern Pike and Salmon. Special designed for Christmas, Thanksgiving Day, Father's Day ect. Delivering advanced versatility and a wide-reach attraction, the Strike King Rage Swimmer provides anglers with universal appeal that can be utilized with a wide range of tactics. Poured with an innovative rib design, the Strike King Rage Swimmer improves texture and vibration for more fish-catching performance. Whether it is slowly crawled over deep structure on a jig head or burned over submerged grass as a spinnerbait trailer, the Strike King Rage Swimmer delivers industry-leading performance that is always effective. Last Cast Tackle is a company of fishing enthusiasts that creates and carries products we fish with ourselves. All of our products are high quality at a great value. The Saltwater Flats Jig Head features premium black nickel chemically sharpened hook. We've added lifelike reflective 3-D eyes. The beautifully sculpted, functional head with chip resistant paint is the most durable on the market. Each head has bait keeper barbs that will keep your soft baits in place. Quality construction and premium hooks. Our REELdiculous "Slammer" is the best flat sided jig, hands down. It's an asymmetric 3D designed jig with a mirrored finish. The "Slammer" is a rear/center balanced jig that performs excellent in vertical drop situations. It's the go to jig for deep water angling. This jig shoots to the bottom like a torpedo, faster than any jig on the market. It's the ultimate jig for deep water anglers who are targeting any type of bottom dwelling species. Our "Slammer" weights range from 100 grams to 350 grams to cover any current or depth. 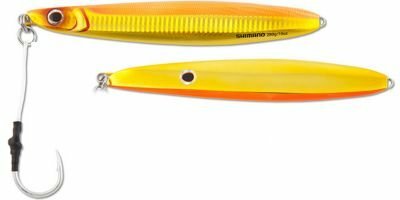 Shimano Butterfly Flat-Fall Jigs add a totally unique dimension to the butterfly jigging technique. Drop the jig down to the bottom, then crank it up 30 feet and free spool. Or cast the jig and let it fall while free spooling, wait for the bite, then jerk and repeat. The center balanced jig falls with a wobbling action in a horizontal position, remaining the strike zone longer than other butterfly jigs. From an angling perspective, every individual who has owned and enjoyed using Shimano tackle has a reason to thank a Japanese visionary named Shozaburo Shimano, who in 1921 declared "I aim to make Shimano's products the best in Kansai, then the best in Japan, and finally the best in the world. "For over 80 years, Shimano has concentrated on precision engineering, one step at a time. Creating the most innovative products and processes you can hold in your hand today. 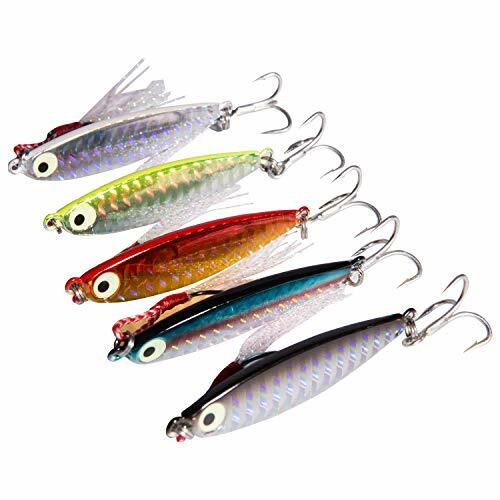 BASS FISHING LURES FEATURE The skirt collar combines with the plastic keeper to keep your bait tight up against the head for a realistic presentation. Very interesting design, effective and very responsive and loud in the water. Rattle has very good sound. Realistic swimming action make fishing jigs a powerful tool for fishing anglers.  Premium silicone skirt adds the swimming action muskie or Bass can't resist. Vivid color skirt makes fishing bass jigs more attractive. More durable and a better quality skirt, makes fishing easier. 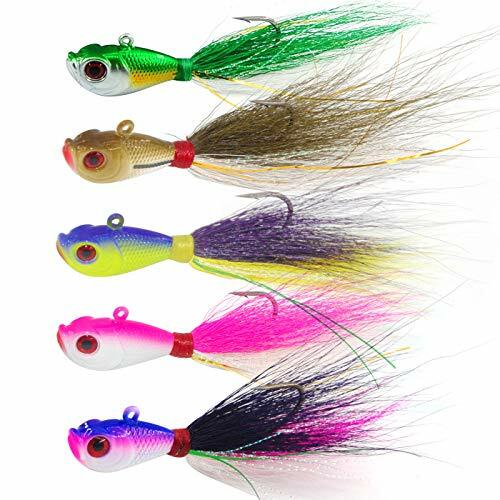 Note for Fishing jigs Colors: We have different colours of this jigs, and we will send the color in random, but please don't worry, usually it won't repeated. 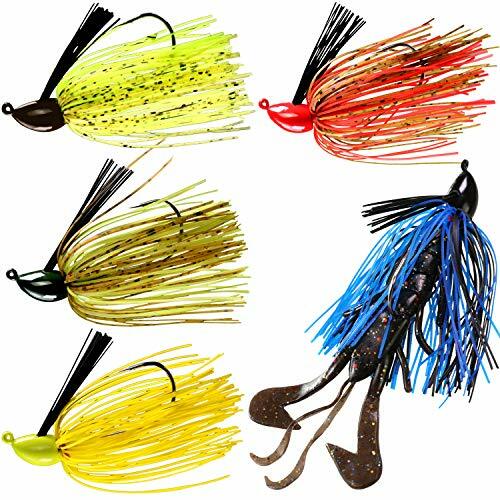 Package includes AT LEAST 5 COLORS BASS FISHING JIGS. Weed guard prevents snagging on brush and vegetation. Each bass jig includes heavy weed guard to help come through cover easier. With Strong Wire Hooks and Weed Guards the Fishing Jigs Perform Rocky or Weedy areas. Made of black nickel high quality carbon steel, the VMC hook is sharp and durable. Chemically-sharpened barbed hook point allows deeper penetration, keeping the fish firmly planted when it tries to make last-minute run or jump. Note: The package doesn't include trailer (A trailer is something you put on that hook. A soft plastic lure like a swim bait or creature bait). weight:7g (1/4oz) / 10g (3/8oz) 14g (1/2oz) . Hooks Length: 3.5cm/1.37in (around). REALISTIC SWIMMING ACTION JIGS: The skirt collar combines with the plastic keeper to keep your bait tight up against the head for a realistic presentation. Very interesting design, effective and very responsive and loud in the water. Rattle has very good sound. Realistic swimming action make fishing jigs a powerful tool for fishing anglers. ATTRACTIVE PREMIUM SLICONE SKIRT : Premium silicone skirt adds the swimming action, muskie or Bass can't resist. Skirt makes fishing bass jigs more attractive. More durable and a better quality skirt, makes fishing easier. 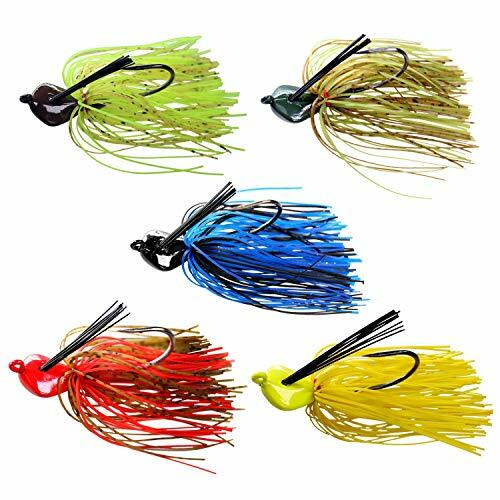 Note for Fishing jigs Colors: We have different colours of this jigs, and we will send the color in random, but please don't worry, usually it won't repeated. 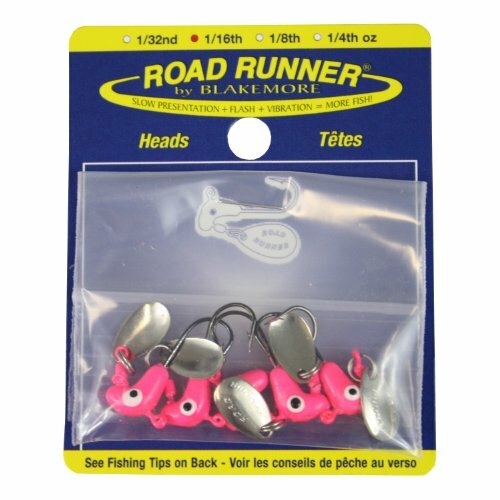 Package includes AT LEAST 5 COLORS BASS FISHING JIGS. WEED GUARD DESGIN BASS JIGS: Weed guard prevents snagging on brush and vegetation. Each bass jig includes heavy weed guard to help come through cover easier. With Strong Wire Hooks and Weed Guards the Fishing Jigs Perform Rocky or Weedy areas. 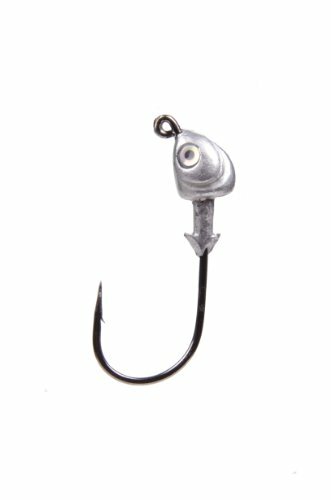 SURPER SHARP DURABLE HOOK: Made of black nickel high quality carbon steel, the VMC hook is sharp and durable. Chemically-sharpened barbed hook point allows deeper penetration, keeping the fish firmly planted when it tries to make last-minute run or jump. Note: The package doesn't include trailer (A trailer is something you put on that hook. A soft plastic lure like a swim bait or creature bait). FISHING JIGS WEIGHT SELECTABL: 7g (1/4oz) / 10g (3/8oz) 14g (1/2oz) . Hooks Length: 3.5cm/1.37in (around). They worked great for lake small mouth and large mouth bass.24h friendly customer service and email support. If you have any problem, please contact our customer support and we will reply you within 24 hours. Developed with the keen input of Strike King's pro-staff, the Strike King Thunder Cricket Vibrating Jig has been fine tuned to produce a constant, hard-pulsing action without fouling. Based around Strike King's innovative, recessed head design, the Strike King Thunder Cricket Vibrating Jig features a premium vibrating blade, which imparts an erratic action and provides trailers with an exaggerated movement for heightened realism. Molded with a screw-lock bait keeper, the Strike King Thunder Cricket Vibrating Jigs lock soft plastics firmly in-place to eliminate slipping and extend the life of the bait. Complete with a premium skirt and a top of the line paint job, the Strike King Thunder Cricket delivers erratic and incredibly lifelike presentation that will earn a year-round spot on your deck. Please be careful with your fingers when you use the fishing hook. Temorah adhere to Amazon Return Policy. 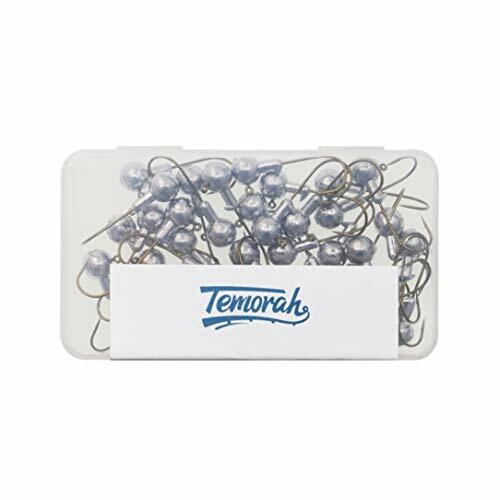 Temorah will take full responsibility for any quality problems within 30 days. Superior quality general purpose fishing jigs. 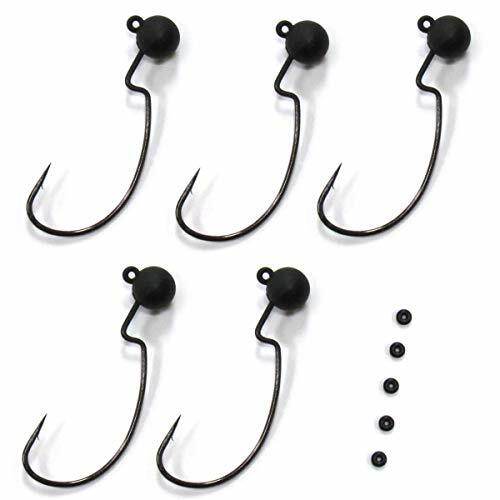 Hook Sizes: (1/32oz - #6 hook) (1/16oz - #4 hook) (1/8oz - #2 hook)(3/16oz - #1 hook) (1/4oz - #1 hook) (3/8oz - #2/0 hook) (1/2oz - #3/0 hook). We try our best to make the best hook for fishman,Jig by Temorah made. FISHING JIGS FEATURE With its compact hydrodynamic head, Jig is more adept at working its way through brush without snagging than standard lead jig heads. With its snagless weedless head design, fray reducing inverted line tie and extra strong weed guard, Jig glides easily through tough cover where big bass hole up in less than ideal conditions. Premium silicone skirt imparts great action. Fishing jig skirt is precisely matched to a custom-colored head for maximum visual stimulation. More durable and a better quality skirt, makes fishing easier. Very interesting design, effective and very responsive and loud in the water. Realistic swimming action make it a powerful tool for fishing anglers. The fishing jigs are very versatile. Weed guard prevents snagging on brush and vegetation. Each bass jig includes heavy weed guard to help come through cover easier. With Strong Wire Hooks and Weed Guards the Fishing Jigs Perform Rocky or Weedy areas. Made of black nickel high quality carbon steel, the hook is sharp and durable. Swims with hook point up to improve hookset percentages. Note: The package doesn't include trailer (A trailer is something you put on that hook. A soft plastic lure like a swim bait or creature bait). Awesome variety of colors for any water conditions. Vivid color, makes the fishing bass jig more attractive. The fish can not can't resist it .Weight: 16g (1/2oz). Fishing bait length: 85cm/3.54in. Package included 5 colors fishing lures. COMPACT HYDRODYNAMIC HEAD JIGS: With its compact hydrodynamic head, Jig is more adept at working its way through brush without snagging than standard lead jig heads. With its snagless-weedless head design, fray-reducing inverted line tie and extra-strong weed guard, Jig glides easily through tough cover where big bass hole up in less-than-ideal conditions. ATTRACTIVE PREMIUM SKIRT DESIGN: Premium silicone skirt imparts great action. 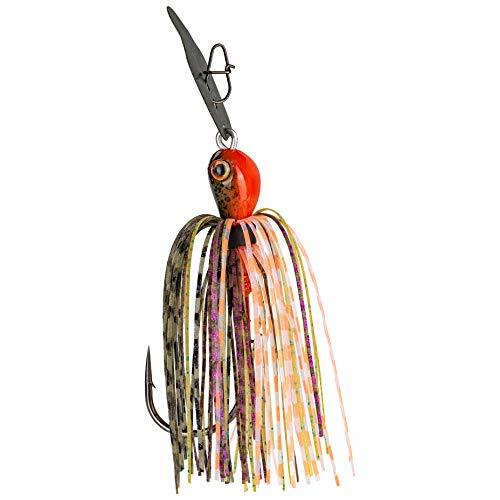 Fishing jig skirt is precisely matched to a custom-colored head for maximum visual stimulation. More durable and a better quality skirt, makes fishing easier. Very interesting design, effective and very responsive and loud in the water. Realistic swimming action make it a powerful tool for fishing anglers. WEED GUARD DESGIN FISHING JIGS : The fishing jigs are very versatile. Weed guard prevents snagging on brush and vegetation. Each bass jig includes heavy weed guard to help come through cover easier. With Strong Wire Hooks and Weed Guards the Fishing Jigs Perform Rocky or Weedy areas. SHARP AND DURABLE HOOK: Made of black nickel high quality carbon steel, the hook is sharp and durable. Swims with hook point up to improve hookset percentages. Note: The package doesn't include trailer (A trailer is something you put on that hook. A soft plastic lure like a swim bait or creature bait). 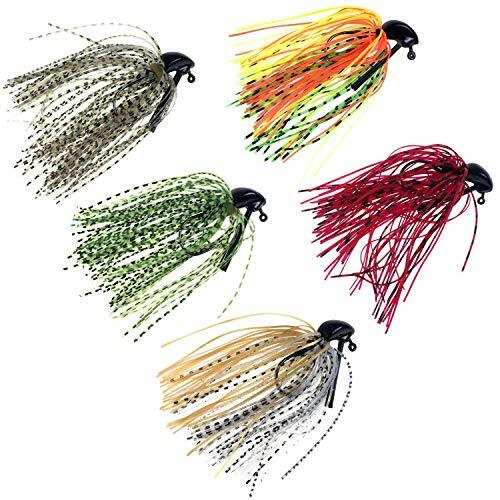 AWESOME VARIETY COLORS JIGS: Awesome variety of colors for any water conditions. Vivid color, makes the fishing bass jig more attractive. The fish can not can't resist it .Weight: 16g (1/2oz). Fishing bait length: 85cm/3.54in. Package included 5 colors fishing lures. 24h friendly customer service and email support. If you have any problem, please contact our customer support and we will reply you within 24 hours. PREMIUM MADE - Bucktail made of quality material, provides realistic glides-through and swim-along action in water, set this jig from those cheap products who hang straight down after hitting water. UNIQUE DESIGN - Bucktail jigs combines old-school materials with a unique design that brings the whole lure to life, creates a distinct vibration unlike any other lure on the market. LIFELIKE ACTION - JSHANMEI saltwater lures has a unique profile with a lifelike movement and a realistic eye. Made with the most specified materials for corrosion resistance to both fresh and saltwater hooks. STRONG HOOK - This hair jig is equipped with a super-sharp hook to cast for bass, walleye, striper, crappie and many other species. 1.High Quality Fishing Jigs:The skirts made of high quality silicone,superb soft material and bright color skirts to better attract the fish. the fishing jigs with heavy weed guard to hide the hook help come through cover easier. Work effectively, jigs for flipping, pitching and casting in and around cover. 2.Strong And Sharp Fishing Hook:high carbon steel fishing hooks,super strong and sharp point. the hook point is curved inwards to better hook the fish,fish do not easy to ran away. 3.Great Construction And Design:High quality paint on the jig head itself. Diamond-shaped lead heads fishing jigs with a bunch of dense elastic brush,the weed guard is very sturdy, anti-hanging grass,anti-hanging bottom,anti-winding. The "hook" for securing the creature bait is great,do not easy to slide off. The noise-maker is an added perk which drives bass wild. Jigs can be used along or use with a trailer,craw,crawbug,a soft plastic lure like a swim bait or creature bait. 4.Specification:total length is about 85mm/3.45in,weight is about 19.8g/0.7oz.Lead head and soft rubber skirts. Excellent color choices:there are 5 colors to choose from. Application for saltwater freshwater,river or lakes,pond. Great motion in the water,add trailer soft bait and bass go crazy. 5.Definitely a must buy item for the summer. Ideal jigs for flipping, skipping, or fished as a swim jig. You can flip this jigs into all sorts of cover and the weed guard is strong enough to stay put. BUY WITH CONFIDENCE: 24h friendly customer service and email support. If you have any problem, please contact our customer support and we will reply you within 24 hours. 1.High Quality Fishing Jigs:The skirts made of high quality silicone,superb soft material and bright color skirts to better attract the fish. the fishing jigs with heavy weed guard to hide the hook help come through cover easier. Work effectively, jigs for flipping, pitching and casting in and around cover. 2.Strong And Sharp Fishing Hook:high carbon steel fishing hooks,super strong and sharp point. the hook point is curved inwards to better hook the fish,fish do not easy to ran away. 3.Great Construction And Design:High quality paint on the jig head itself.Diamond-shaped lead heads fishing jigs with a bunch of dense elastic brush,the weed guard is very sturdy, anti-hanging grass,anti-hanging bottom,anti-winding.The hook for securing the creature bait is great,do not easy to slide off. The noise-maker is an added perk which drives bass wild.Jigs can be used along or use with a trailer,craw,crawbug,a soft plastic lure like a swim bait or creature bait. 4.Specification:total length is about 85mm/3.45in,weight is about 19.8g/0.7oz.Lead head and soft rubber skirts. Excellent color choices:there are 5 colors to choose from. Application for saltwater freshwater,river or lakes,pond.Great motion in the water,add trailer soft bait and bass go crazy. 5.Definitely a must buy item for the summer. Ideal jigs for flipping, skipping, or fished as a swim jig. You can flip this jigs into all sorts of cover and the weed guard is strong enough to stay put. Very popular with angler. BUY WITH CONFIDENCE: 24h friendly customer service and email support. If you have any problem, please contact our customer support and we will reply you within 24 hours. The Ned Rig is one of the hottest finesse rigs to hit the fishing market in recent years. This subtle, finesse presentation can produce quantity and quality catches, especially when bass are pressured/finicky and unwilling to chase power fishing presentations such as crankbaits, spinnerbaits, topwater, and other moving baits. With Harmony's Tungsten Offset Weedless Ned Rig Jigheads, you can take advantage of the fish catching ability of the Ned Rig, while opening up the ability to fish this incredibly effective rig in areas of heavier cover, such as vegetation, docks, brush, laydowns, rocks, and more, without getting hung up like other Ned Rig jigheads. Harmony's 1/8oz Tungsten Weedless Ned Jigheads are best paired with small floating finesse baits such as Z-Man's Finesse TRD, Finesse ShadZ, Trick ShotZ, and Finesse HogZ; but can be fished effectively with any small/subtle soft plastic bait. Simply cast your Ned Rig to the target and let it sit still, or shake the rig in place, drag it, and hop it along the bottom to learn how effective it can be on largemouth, smallmouth, and spotted bass in lakes, ponds, reservoirs, rivers, and even tidal bodies of water throughout North America and the world. Harmony's Tungsten Offset Ned Rig Jigheads are made of 97% pure tungsten for a density that is almost twice as dense as traditional lead jigheads. The higher density equals higher sensitivity, as well as a smaller jighead for the same weight, making the rig less prone to snagging grass/weeds and getting hung up in heavy cover such as laydowns and under docks. Includes five (5) jigheads and five (5) Bait Pegs. 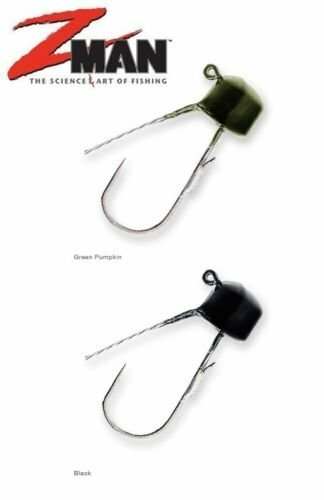 Bait Pegs slip onto your hook and keep your securely bait pegged in place, without tearing baits like rigid bait keepers that come attached to other hooks. Bait Pegs allow your bait to last longer before tearing, saving you time and money. Harmony's Tungsten Offset Weedless Ned Rig Jigheads take Ned Rig fishing to the next level. The offset hook design allows you to fish where no other Ned Rig has been before. This rig's snagless design allows it to slip through grass, weeds, lily pads, brush, wood, rocks, and other cover better than any other. The tungsten head is nearly twice as dense as lead, allowing for a smaller, more compact size head than the same weight lead jig head. The higher density also translates to greater sensitivity, allowing you to feel the bottom better than lead Ned Rig jigheads. Thin wire Razor Series hook is paired perfectly with each size Ned Rig jighead, allowing floating baits like the Finesse TRD to stand up as they were intended. This thin-wire hook is ideal for ensuring proper penetration during hooksets with the lighter rods and lines used with the Ned Rig. Includes five (5) jigheads and five (5) Bait Pegs. 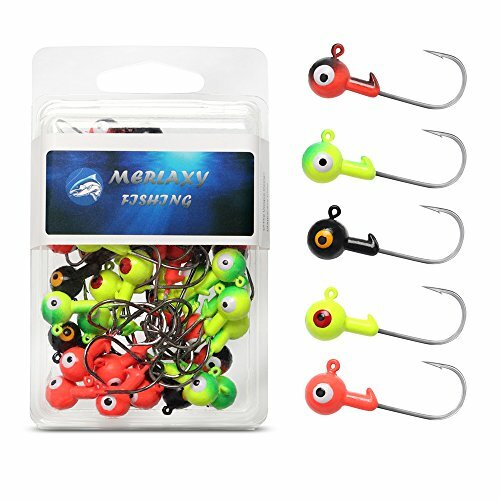 Bait Pegs slip onto your hook and keep your securely bait pegged in place, without tearing baits like rigid bait keepers that come attached to other hooks. Bait Pegs allow your bait to last longer before tearing, saving you time and money. Manufactured and Warrantied by Harmony Fishing Company. Start your ignition, get set, go. Go spinning that is with the brand-new release of the Bassdash distance casting jigs. 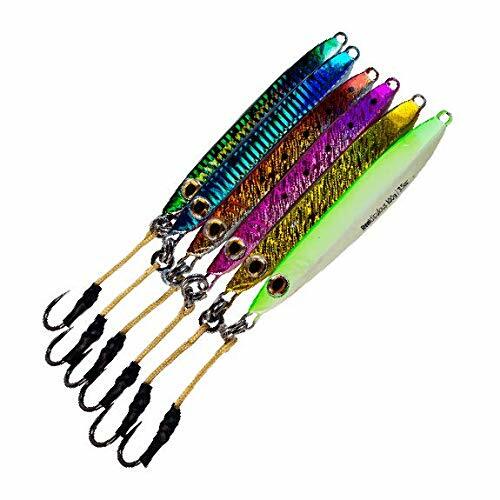 A series of affordable metal spinning lures designed for rock and beach anglers to target all your favourite saltwater sports series as well as freshwater game fishes. Peg the jig out and chances are you will hook up!